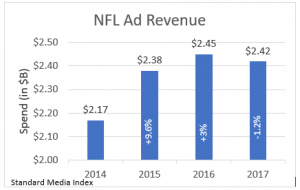 Advertising revenue during in-game NFL programming declined -1.2% during the 2017 regular season, earning a total $2.42 Billion dollars, according to Standard Media Index, the only advertising intelligence firm to source detailed and complete data directly from the major media holding companies. This is based on total ad spend figures for the 2017 NFL regular season from Sept. 7 to Dec. 31 for NBC, CBS, FOX, and ESPN broadcasts. “For the first time since we have been tracking the market we saw a slight drop of in-game dollars. Despite a fairly significant fall in ratings, CPM’s were strong and demand continued to be high.” said Standard Media Index CEO James Fennessy. “This again demonstrates that the NFL remains the powerhouse of national TV ROI. Advertisers understand the exceptional return they get as a result of the large, engaged and guaranteed audiences enjoying a full screen experience in this unique environment.” Commercial Load, Rates and ADUs Commercial loads during NFL games remained flat. Paid Unit rates (excluding ADUs) grew +1.2% from $499,000 to $505,000 per 30-second spot. However, delivery of ADUs – or makegoods – grew from 21% to 23% of the units due to lower ratings. Advertising Categories The Auto industry was the top advertiser in the NFL and spent nearly 50% more than Consumer Electronics, which was the next largest advertiser category. These categories both declined in 2017 with Autos down -5.4% and Consumer Electronics down -3%. Meanwhile, Insurance (+30%), Alcoholic Beverages (+16%), and Quick Serve Restaurants (+6.4%) each increased their NFL advertising this year.